The Strathspey Railway is operated under the Parliamentary authority of a Light Railway Order granted in 1978. The Order authorised tracklaying up to within 100 metres of the River Dulnain. These powers were exploited between 2007 and 2012 when volunteers working under the direction of the railway’s paid Outdoor Superintendent cleared ¾ of a mile of overgrown trackbed between Broomhill and the river; brought to site and laid into position nearly 1600 concrete sleepers; brought to site and laid 140 lengths of steel rail on top of the sleepers; fastened everything together with 264 fishplates, 528 nut and fishplate bolt sets, 6400 rail clips, a similar number of nylon spacers, and 3200 rubber pads; dropped several thousand tons of stone ballast around the sleepers using the railway’s own hopper wagons; and packed the ballast around and under the sleepers to set and keep the track at the correct smooth level and curvature. The rails and sleepers had been donated to the railway by Network Rail as the beginning of the century, but everything else had to be bought with funds donated by supporters and well wishers; and the Strathspey Railway Association volunteers’ time and labour, even if costed just at living wage rates, would represent many tens of thousands of pounds of investment. BR’s removal of the bridge over the River Dulnain made a significant physical gap in the line but from the earliest days of the railway it has also been a psychological and procedural obstacle. 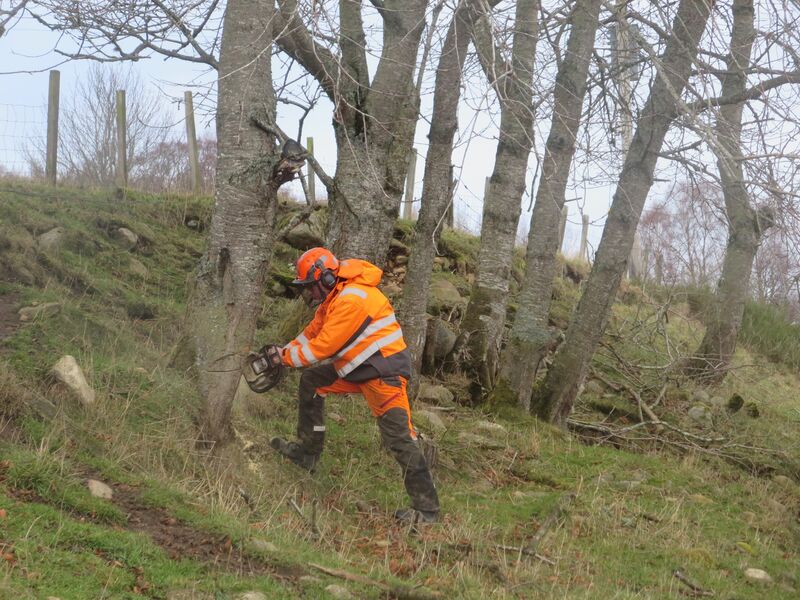 For example, the Highlands and Islands Development Board’s backing of the project was hampered by the fact that at the time the land north of Grantown was in the County of Moray, which was not part of the area in which the Board could operate. Replacing the bridge would therefore not just be a small physical step nearer to Grantown but also a leap into new procedural territory. Because of the remoteness of the site from roads and the protected status of the river it would also be a challenging piece of construction. The bridge design was undertaken by current advisor Mike Tough and planning permission obtained from the National Park Authority in 2012. The design was based on the re-use of a redundant railway bridge from Motherwell, where it had carried the railway line into Ravenscraig steelworks over the A725. The bridge became an example of the goodwill and support which the railway enjoys in the local community and the professional railway world. A local engineering company adapted the girders to suit the Dulnain span’s length and alignment then shotblasted and painted the components free of charge; a local quarry operator donated ballast; and rail infrastructure company Corus Rail loaned us one of their most powerful rail-mounted cranes and its staff to erect the main spans. After four working weekends during which volunteers took the track right up to the edge of the gap, the Corus crane erected the main spans on Valentine’s Day 2014 – coincidentally the same day on which the new Borders Railway’s Hardengreen Viaduct was erected! Over the remainder of 2014 and through 2015 volunteer work parties completed the installation and fastening of cross beams to the main spans; the laying of a temporary work deck; installation of metal troughing and wooden longitudinal beams to carry the rails; laying and fastening of rails across the bridge; and conversion of the temporary decking timbers to permanent fixed safety decking. The plan drawings of the bridge over the River Dulnain can be viewed on Highland Council’s website by clicking HERE or by searching the planning page of the Council’s website using application case reference 12/02438/FUL. The Rails to Grantown section of the railway’s website photography@strathspeyrailway.co.uk constains a number of images of the preparation, erection and completion of the bridge. The next three-quarters of a mile of line crosses Ballintomb Farm on a low embankment. Part of the embankment has been usded as an access road by the farm so we will need to build a new farm road parallel to the railway with three level crossings to maintain the farm’s access to all its fields, clear and deepen a cattle creep under the line near to the farm buildings, reinstate and improve drainage and repair fencing before track can be laid. Until the early 1970s the A95 dived under the railway on a reverse curve using a stone arch bridge through the railway embankment. The bridge is still there, but the embankment south of it was removed by Moray and Nairn County Council in order to realign the road on its present day course. In 1975 the area around Grantown became a part of Highland Region. The Regional Council started to improve the A95 in stages. The Council supported the railway’s ambitions and when it designed a further improvement of the road at Gaich it accommodated the railway in its design – fortunately, the differences in level between road and railway at a critical point are such that a bridge to carry the road over the railway is feasible. The Council would even have paid for the bridge, but just three weeks before contracts for the scheme were to be let the Government of the day abolished the Regions and made the A95 a Trunk Road. This meant that improving this section of the road had to take its place in a national list of priorities (which inevitably meant a long way down from the top). It also meant that there was much less likelihood of the authorities paying for the tunnel. An improvement at Gaich remains in the national road improvement preparation programme and the design adopted by the Scottish Government’s transport agency (Transport Scotland) is substantially similar to the 1990s design produced by Highhland Region. Transport Scotland’s position is that if the railway secures the necessary Statutory Orders for the scheme and shows that it can pay the cost of the underbridge they will seek Government funding to undertake the road improvement. No budget can be allocated to the scheme until Statutory powers exist. It is because of the almost unique nature of the scheme – a national trunk road crossing a heritage railway – that the decision was taken to use the Transport and Works Act procedure to secure permission for the whole extension rather than seeking a new planning permission. Inevitably, this is also the biggest funding challenge for the Trust, whose contribution will have to be between £1.5 millions and £2 millions. The Gaich scheme will include re-creation of the missing embankment in the field on the west side of the road. All of the engineering works including service deviations, new road and railway embankments and the building of the trunk road and side roads are expected to be carried out as part of the road works, leaving the railway simply the task of laying the railway track through the bridge and on towarrd Grantown for a further half a mile. An industrial estate has been built by the Council on the site of the station platforms at the former Grantown West station. The line of the track will therefore have to be raised south of the industrial estate, to rech existing ground levels, then swung behind the industrial estate before rejoining the original alignment just to the north of the former station site. The gradient in the cutting south of the industrial estate will have to be steepened by importation of fill material before track can be laid. Land then has to be acquired from the Council and a nearby landowner to allow a new cutting to be formed taking the line onto existing level ground near to the old station house. A new section of forest road needs built to the west of the railway to by-pass the road’s crossing of the railway line before track can be laid. This was the site proposed for the new terminus station in the 2003 planning permission. Depending on progress, and how soon the community wants to see trains running to Grantown, the site could be developed as a no frills interim terminus while work continues on the final stage. 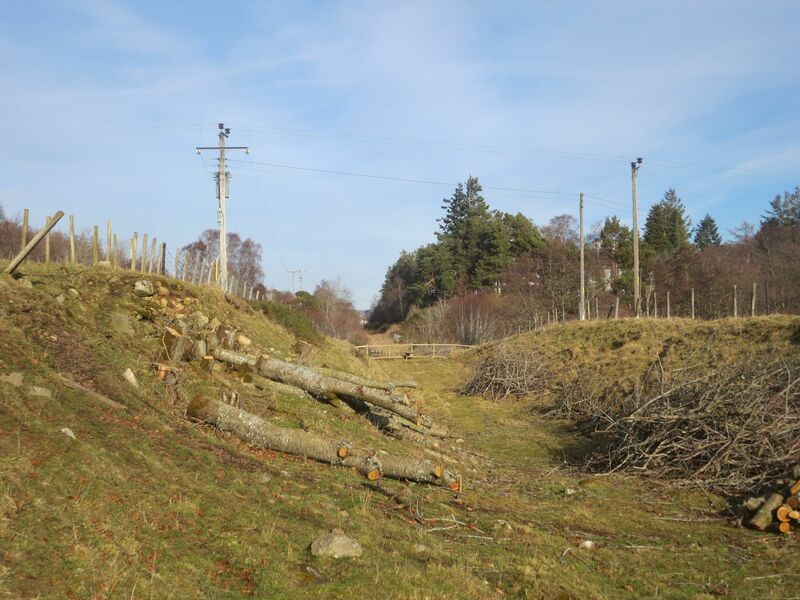 The proposed ultimate terminus site is in the field opposite the Grantown Caravan Site, just below Dulicht bridge and several metres lower in level than the existing old railway embankment. Because the railway which the embankment supported was climbing on a 1 in 80 gradient, by coming off line about a third of a mile west of the old station site it is possible to drop down to the field at a gentle gradient and create the necessary level site for the platforms, although significant earthworks are needed to achieve this. This stage, which will have to include accommodation or diversion of a number of core paths, could cost in the region of £1.25 millions. Nevertheless, the railway and key stakeholders believe it to be a worthwhile ultimate goal because the terminus site is closer to the town centre, which would be reached via a more attractive and welcoming route. It is also next to the caravan site, which is probably the single biggest concentration of holiday accommodation in the Grantown area.